Although it is the second smallest governorate in the Bahrain, Muharraq comprises some of the island kingdom’s most vital destinations. 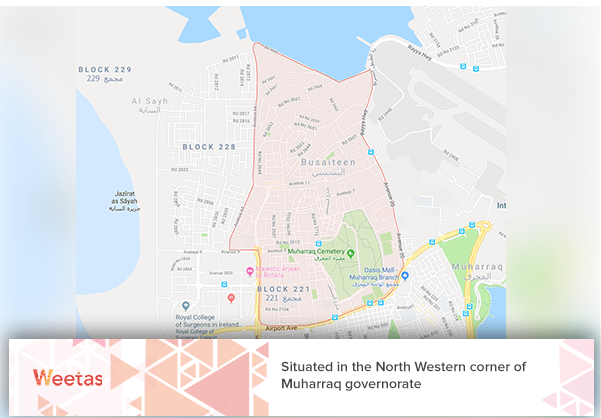 With its location in the north eastern corner of the Bahraini capital, Muharraq is connected to Manama via three causeways; the governorate houses Bahrain International Airport, as well as a number of its monuments and historic sites like Arad Fortress. Muharraq is also famous for its beautiful towns and areas, and Busaiteen comes as one of its most renowned parts. In this article, we will demonstrate everything you might need to know about Busaiteen town including its location, services and facilities, attractions, and property market. Situated in the North Western corner of Muharraq governorate, Busaiteen town’s namesake (literally translated to orchards in English) originates from the large number of gardens which the small town includes. The area accommodates around 42,000 people, most of whom are Bahraini families. Busaiteen enjoys a unique location, as the entirety of both its northern and western sides look over the gulf waters; this grants the town’s residents access to one of the longest beaches of the kingdom. On the other hand, it borders the International Bahrain Airport road to the south, which also separates it from the main Muharraq city, and the airport itself to the east. 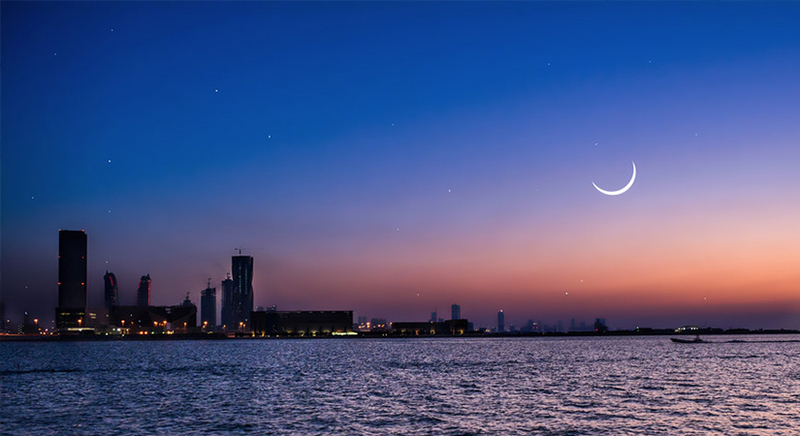 Most importantly, Busaiteen is linked directly to Manama and the main island of Bahrain via Sheikh Isa bin Salman Causeway; the causeway provides the town’s residents quick access to Manama’s most vibrant areas like Juffair and Seef. 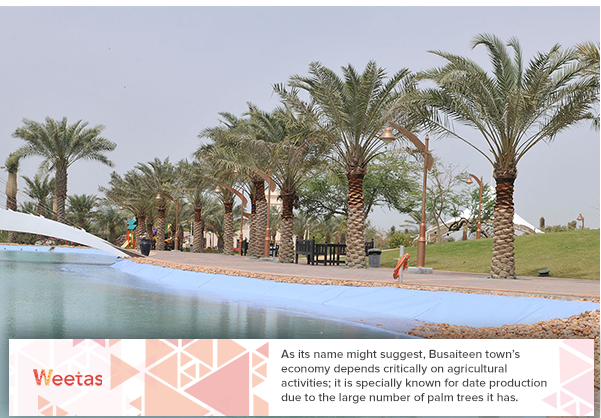 As its name might suggest, Busaiteen town’s economy depends critically on agricultural activities; it is specially known for date production due to the large number of palm trees it has. Also, due to the area’s lengthy coastlines that cover two of its four sides, fishing comes as another major component of Busaiteen’s economic activities. Busaiteen doesn’t house a lot of monuments and historic places, perhaps the only exception is the ancient Al Sayah Fortress. 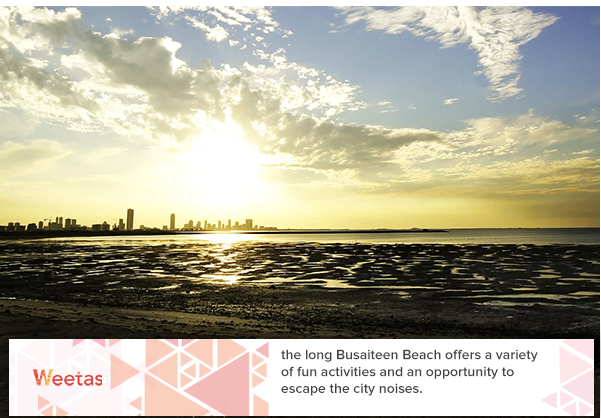 However, the long Busaiteen Beach offers a variety of fun activities and an opportunity to escape the city noises. The long coastal line does not only provide many magnificent swimming spots, but also you can sit there and get yourself a mesmerizing view of the sunset. Additionally, the beach overlooks multiple areas that are rich with the marine life that can satisfy your love for fishing. 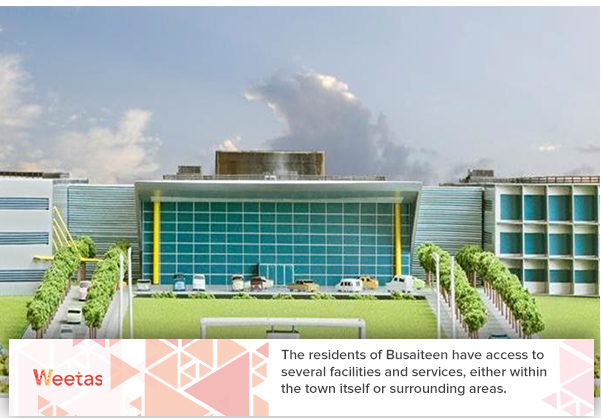 The residents of Busaiteen have access to several facilities and services, either within the town itself or surrounding areas. The town features many essential facilities including Muharraq Health Center and King Hamad University Hospital which is situated near the Royal College of Surgeons in Ireland. Other educational institutions in the area include Sheikh Khalifa bin Salman Institute of Technology, in addition to multiple schools like International French School of Bahrain and Al Hediya Al Khalifia School, the latter is renowned for being the first school to be built not only in Bahrain, but in the entire GCC region. Busaiteen houses Bahrain and Busaiteen Sports Clubs, which are both considered two of the major clubs in the kingdom. Also, the town comprises entertainment and leisure destinations like Al Jazeera Cineplex; not to forget Avenue 11 which includes several restaurants and cafes stacked on both of its sides. It is also worth mentioning that a two-storey shopping mall is currently being built in the town; the mall, known as Busaiteen Shopping Center, will comprise more than 100 outlets for world-class lifestyle brands, as well as a large car-parking space. Last but not least, Busaiteen town contains several large mosques like Rashid Lootah Mosque and Abu Hanifa Al Numan Mosque. 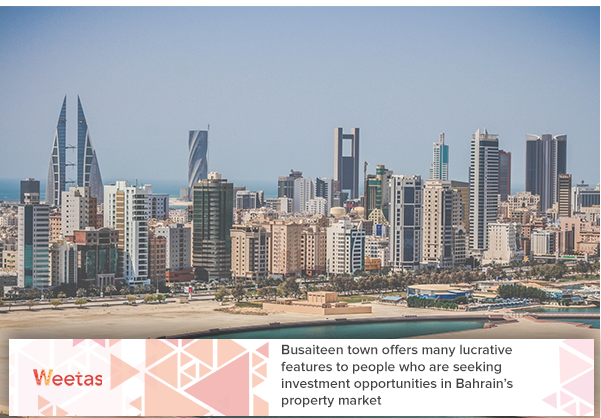 Busaiteen town offers many lucrative features to people who are seeking investment opportunities in Bahrain’s property market. The town does not only provide a serene, quiet lifestyle away from the bustled parts of Bahrain, but it is also a freehold area; this means that non-Bahraini citizens and expats are allowed to own properties in the area. In addition to that, the town is known for its suitable property prices in comparison to other areas of Bahrain. For example, you can find apartments for sale in Busaiteen with prices that start from 48,000BD for one-bedroom apartments and 69,000BD for two-bedroom apartments. If you are more interested in large-scale investments, you can purchase a building in Busaiteen for prices that start from 350,000BD for residential buildings and 440,000BD for commercial buildings. Needless to say, the prices are directly proportional with the buildings’ area and number of units. On the other hand, Busaiteen town has even more variant rental options. If you are looking for renting apartment in Busaiteen, you can find a studio apartment for rent with rentals that start from 330BD. If you prefer larger spaces, the average rental price for renting one-bedroom flat in Busaiteen reaches around 430BD, while renting a two-bedroom apartment there costs 550BD on average. Busaiteen is the perfect choice for people who want a location that combines luxury with countryside serenity for suitable prices. If you are that type of person, make sure to keep an eye on possible investments in that town.